The people I call “sportsmen” are those who get all the right gear, do their research on the fish they’re after, use a navigation system to find the area with the highest concentration of that species, and then use a specialized lure in their active, engaging pursuit. We want our physicians to be just as fired up about “catching” patients and referring providers. They ask us, the social media experts, for tips and advice and we should equip them with the gear they need to be fruitful. We cheer for them, send them success stories, let our excitement be contagious. 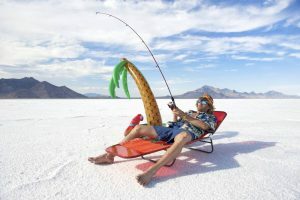 On the other hand, there are people you may see on the beach, lounging next to a cooler with a fishing pole in the sand. They cast out their baited hook, set their rod down, and let the fish come to them. The fishing community calls this the “bait-n-wait” method. A fish may bite, but if the fisherman doesn’t act fast, he’ll miss out. They often look more like sunbathers than fishermen. You probably know physicians like this, who’ve created a Twitter account and are now waiting on patients to come to them. How can we turn these sunbathers into sportsmen? I met with a physician recently who told me he wanted to update his profile on our website. I told him I couldn’t help with the website, but I could help him with social media. This wasn't what he wanted to hear, but when I told him about the opportunities for reaching potential patients as well as referring providers, he wanted to learn more. He wanted to know more about the value of Facebook Live, and if videos and live broadcasts made a difference. When I shared the performance stats of several videos, as well as the number of comments, it piqued his interest. He then asked me to help him develop a strategy for him and his colleagues to become more active on social media. When we meet again, I’ll ask the questions discussed in my last post, to help him identify the tools necessary for catching the fish he desires. Have you made a believer out of a physician? Please share your stories in the comments. In my next and final post in this series, we’ll look at downfalls of being a bait-n-waiter. What do the two types of fishermen have to do with social media usage? 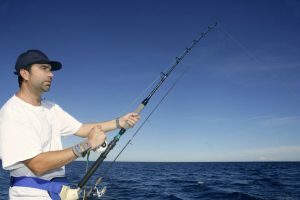 Preparing a physician for social media is much like helping a novice fisherman catch the big one.